I recently spent a week attending some classes for my master's program at the Portland, OR campus of George Fox University. Since I went to high school in Lake Oswego and spent my early married years in the same area, I was in my own stomping grounds. I had a GPS with me, but after a couple of days it malfunctioned, and I quickly realized that I actually had no need for the device. I was in familiar territory, able to navigate from the recesses of my own memory, even though I hadn't lived in the area for over 15 years. Fast forward one month. David had gone to Paris for the day, and when he returned I had to pick him up from a nearby train station. The station is in the town of Amboise, about 20 minutes from Loches. Though I've been there many times, I would've been completely lost without my GPS. We've lived in the same house for 3 years now, and the only place I drive without the GPS is the local grocery store. Granted, I do a lot less driving overall in France in that I did in the States. But still, the difference in my ability to navigate here is a little disconcerting. I've never HAD to get around in France without a GPS, and as a result, I have become entirely dependent upon it. Which kind of makes me feel like I'm getting dumber. And then I remember that I've learned a new language in that same time frame, so maybe I shouldn't reduce my intelligence to my capacity for navigation. Nevertheless, the experience got me thinking about the effects of modern technological advances on the workings of the human brain. I've been reading a book on the subject, and frankly, I find the research to 1.) Accurately reflect my experience and 2.) Prove that the dangers are real. 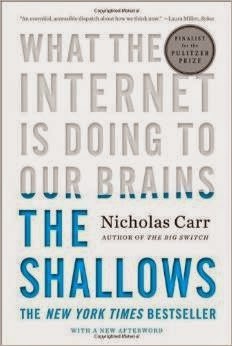 In his book, The Shallows: What the Internet Is Doing to Our Brains, Nicholas Carr explains how different technological advances have changed not only how humans interact with the world and each other, but how our interaction with technology can actually change us. For example, consider how the invention of the clock changed human behavior. Carr writes, "In deciding when to eat, to work, to sleep, to wake up, we stopped listening to our senses and started obeying the clock. We became a lot more scientific, but we became a bit more mechanical as well." Looking back through history, how humans have stored and shared knowledge has evolved with technological advances. Originally knowledge was passed on orally. Eventually writing was invented, and a few elite members of society were given the privilege of learning to read and write. Scrolls or tablets belonged to either very wealthy people or they were communal property, stored in places such as churches or monasteries. For reasons of limited access and limited education, reading was a public activity, always done orally so that many could benefit. It wasn't until the invention of the printing press in 1439 that books became both portable and inexpensive, thereby giving access to the masses. That technological advance was so significant that many scholars were skeptical. They believed that such indiscriminate access to information could have a negative effect on society as a whole. The printing press didn’t just change WHO could read and WHAT could be read, it changed HOW humans engaged in the act of reading. Instead of being a public activity, for the first time in history, reading became a personal and private activity. People were more reflective, contemplative, and engaged in the information that was available to them. The printing press also changed how people wrote. Not only did written structure become more concise and less repetitive, people were willing to write different things. There are some things that one might not dare to read aloud around a campfire, but would delight to read at home alone. Thus, the reason for the lament over the ills of the printing press. Fast forward 550 years. Passing by inventions such as radio and television, we arrive at the age of the Internet. Like books, radio and TV are one-way media--information can only flow in one direction. The Internet changed not only how we are sharing knowledge, but made knowledge sharing bi-directional--or rather multi-directional as many can interact with the same subject simultaneously. "The Net's cacophony of stimuli short-circuits both conscious and unconscious thought, preventing our minds from thinking either deeply or creatively." 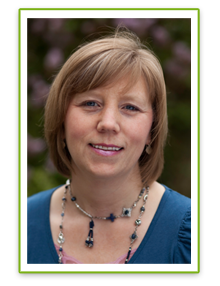 "In reading online, Maryanne Wolf says, we sacrifice the facility that makes deep reading possible. We revert to being 'mere decoders of information.' Our ability to make the rich mental connections that form when we read deeply and without distraction remains largely disengaged." "We willingly accept the loss of concentration and focus, the division of our attention and the fragmentation of our thoughts, in return for the wealth of compelling or at least diverting information we receive. Tuning out is not an option many of us would consider." Attentiveness, memorization, and deep thinking are becoming lost arts--and their loss has critical implications for our ability to be creative and innovative. But it is not only our intellect that suffers. It turns out that our ability to show empathy and compassion is also diminished by distractions. So The Shallows has me rethinking not only how much time I spend online, but how I spend that time. I find that I can hardly sit through an entire movie at home without checking email, playing Words with Friends, or browsing Facebook. The distractions don't have to come looking for me, I go looking for them. And now that I know that such behavior is actually re-wiring my brain, I'm concerned. And I plan to do something about it.